No. Habitat homeowners help build their own homes alongside volunteers and pay an affordable mortgage. 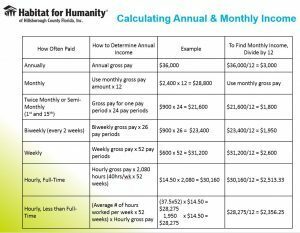 Use this table to calculate your annual and monthly income. Where does Habitat Hillsborough build? Does Habitat require a down payment? No down payment is required. However, future homeowners are required to pay closing costs and work Sweat Equity, which is each future homeowner’s investment into their property. Sweat Equity is the actual physical labor that future homeowners work building Habitat homes or volunteering in the Habitat ReStore or Habitat administrative offices. There is no monetary value to Sweat Equity. It does not qualify as down payment. Sweat equity is intended to contribute to three fundamental goals in the Habitat program: 1. Partnership; 2. Pride in ownership and 3. Development of skills and knowledge. No, but decent or repairable credit is important. Habitat Hillsborough examines the credit history, rather than just a credit score. The limit for non-medical collections is $1,500 total. Non-medical collections must be paid off prior to closing. Habitat Hillsborough does not consider medical collections unless a single collection is $2,000 or more. Bankruptcies must be discharged for at least 24 months. 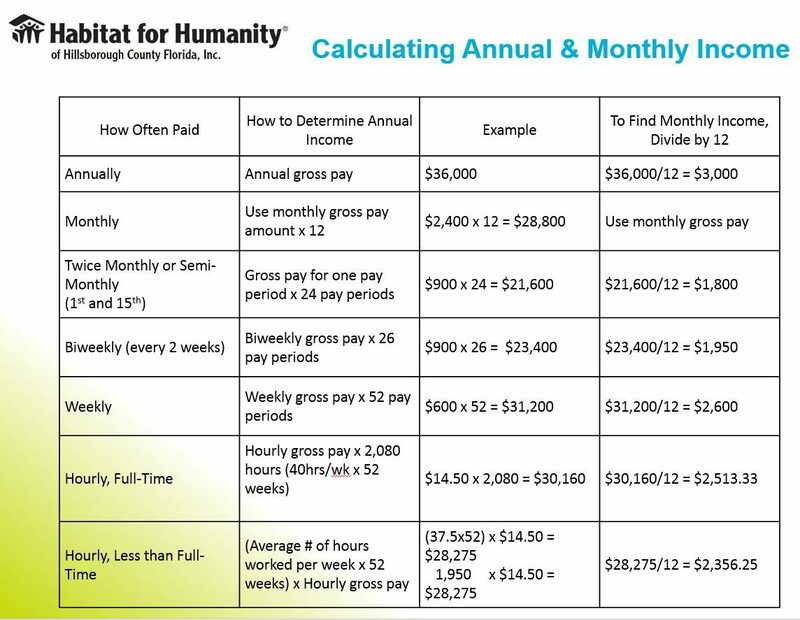 What expenses does Habitat consider in the Ability to Pay? Habitat considers what shows up on a credit report: revolving credit (credit cards), car loans, student loans, any other type of installment loan, etc. We don’t consider car or life insurance or child care. Does an applicant have to have children to be eligible for the Habitat Homeownership Program? No! Habitat Hillsborough is an Equal Housing Opportunity Lender. The 3 areas which Habitat Hillsborough considers for eligible applicants are 1) Housing Need; 2) Ability to Pay and 3) Willingness to Partner. What does "eligible applicant" mean? Since the mission of Habitat Hillsborough is to provide access to affordable home financing, we serve applicants whose total household income falls between 30% and 80% of Area Median Income as defined by HUD. Eligibility for the Habitat Homeownership Program is different than the Ability to Pay. How can someone apply to the Habitat Homeownership Program? The Habitat Hillsborough Homeownership Program is accepting Initial Screening Forms at this time. Please click on the Initial Screening Form button to complete the form. If you are a military veteran, we invite you to click the Veterans Homeownership Initial Screening Form button. Click here to submit an Initial Screening Form!! For US Military Veterans, click here to submit a Veterans Initial Screening Form! The Habitat Homeownership Program may take up 12 to 18 months from the Initial Screening Form and Homeownership Program Application to purchasing a home.